With tape in hair extensions you can have the hair color of your dreams without sacrificing the overall health of the hair. Our hair extensions come with a medical-grade adhesive that locks firm for a secure grip. easiLengths are non-damaging, reusable, and can be applied in a short amount of time, without the hassle of dealing with long chemical processes. 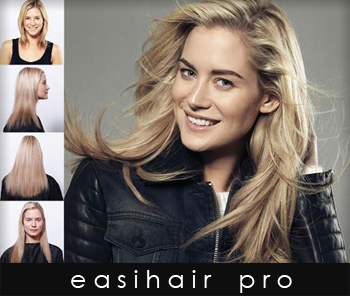 EasiLenghts use ultra light nano-wefts which evenly distribute the weight of each panel. The ultra lightweight nan-wefts distribute hair evenly as the integrate "seamlessly"with your own hair and are 100% Asian hair. Nano-wefts apply quickly, reducing application time by 400%. Applied in 60-90 minutes rather than 8 hours. Tape in extensions can be used for all types of hair but are most suited for people with thin fine hair. Changing your look is fun and allows you the freedom of color change without worry.